Words by Kevin Doocey on July 17, 2013 . Above is supposedly part of a published catalogue of Puma’s 2013⁄14 releases for the forthcoming season. Newcastle United’s away jersey was confirmed a little over three weeks ago, greeted by mixed reaction, but generally everyone seems to agree that it’s not quite as bad as once anticipated. 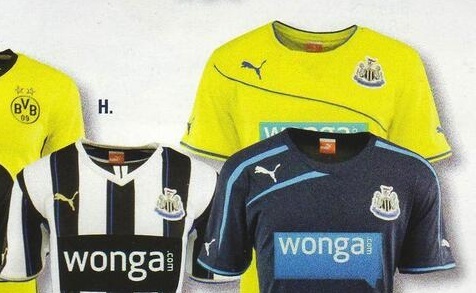 In the picture above, you can see both Newcastle United’s home jersey for the 2013⁄14 Premier League seasons accompanied the released away shirt. 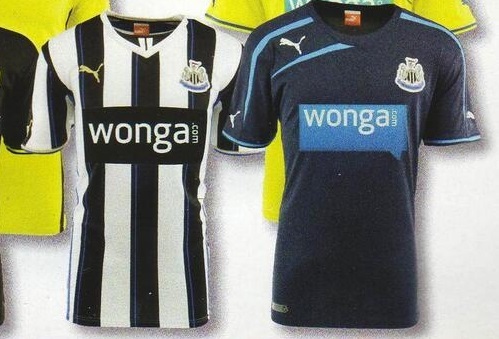 Many expected a bright blue Wonga logo to be emblazoned across the home shirt, but it seems as if common sense has prevailed, and it has been turned black - keeping with the Black and White stripes, as well as a gold Puma logo which looks rather well. The only true essences of Wonga’s colour scheme if a pin stripe down each black stripe, something that is hardly too exciting, but nevertheless it is a lot better than a predominant blue colour throughout the jersey. I have to say that I’m actually happy with the home shirt if it turns out to be like above. While many of the ‘leaked kits’ have proven incorrect in the past - this photo is taken from a Puma catalogue release in America and was kindly put on Twitter by an American NUFC fan. However, not only does it show the home kit, but also if you look beyond the cropped image above, it gives us a glimpse of our expected third kit. What do we think folks? Happy with the home shirt? 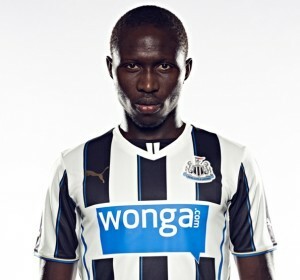 afraid the wonga sponsor spoils, wont be buying due too!